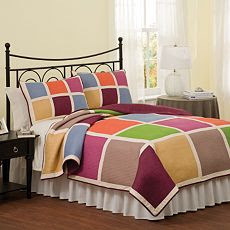 My new bedding from Kohl's! And, no, this isn't MY bed. I am such a thrasher during sleepy time that sharing a cover with my husband doesn't work out so well for him, so for a long time we've each had our own twin sized cover for our king size bed. But when we throw on extra blankets, they tend to not match since I'm not going to buy new blankets to keep it from occurring. I've been wanting 2 new covers so the bed will look neat. I think this color block pattern will help nicely with that. (Don't tell my husband, but I also got some cupcake sheets & pillowcases from Lakeside Collection.com...heehee). It won't bother his manliness one bit since he is such a wonderful guy, which is a treat for me! See you soon as I'm going to post more often with quickies like this one. It's a challenge sometimes to come up with a story to post, so fun little bits of info like this makes it a lot simpler. Thanks to Lori for the tip. I LOVE that bedding! I'm all about color. My problem is I'm barely coherent in the morning (so NOT a morning person!) and we never come upstairs for a thing other than to sleep, so the bed rarely even gets made. Love the colors in this spread. The cupcake sheets will be too cute with this.